You can even get a gold Surface Pen to go with your powerful new device. Microsoft’s Surface Book and Surface Pro 4 were some of the sleekest new devices of 2015, but they still suffered from some limitations that give power users pause. Namely, the initial Surface configurations offered limited storage and memory options, with no opportunity to crank every aspect of the systems to 11. Good news, deep-pocketed PC enthusiasts: On Friday, Microsoft rolled out potent new Surface Book and Surface Pro 4 configurations with all the firepower you could ask for. 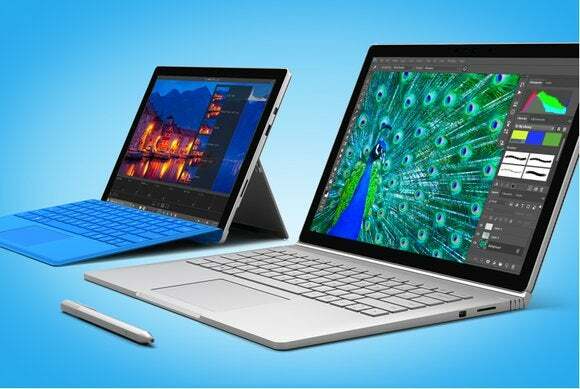 The high-end Surface Book and Surface Pro 4 options both come equipped with an Intel Core i7 processor, 16GB of RAM, and a spacious 1TB solid-state drive. And yes, the high-end Surface Book offers the discrete Nvidia graphics that help Microsoft’s laptops stand out from the crowd. But all that hardware doesn’t come cheap, of course: The new Surface Book will set you back $3,200, while the beefiest Surface Pro 4 costs $2,700. Now you can snag a gold Surface Pen for $60. Appropriately enough, Microsoft’s also rolling out a gold version of its Surface Pen to coincide with the launch of the high-end Surface systems. Other than the blinged-out hue it’s the same stylus that ships with the SP4, but the $60 gold Surface Pen ships with Microsoft’s Surface Pen Tip Kit that lets you swap out the stylus’ tip to change up your drawing style. The impact on you at home: So which should you buy if the $500 price gulf between the two devices isn’t enough of a deciding factor? Check out PCWorld’s Surface Book vs. Surface Pro 4 shoot-out for all the info you need to make an informed decision. And no matter which Microsoft system you settle on, be sure to check out our guide to the 11 secrets you didn’t know about your new Surface Book or Surface Pro 4. You’ll learn some nifty new things.